The Easton Lions Club works to keep the Yardley-Wood Rink open for skating each winter, hosts scarecrow days, family fun days & canoe days at the rink next to Center School on Depot Street in Easton. The rink is near the intersection of Center Street and Rt 123. From it's inception, the rink has been a safe place for the community to enjoy skating for free during the winter months. The Lions support the rink by running a snack shack, skate swaps, paying the electric bill for the night-skating until 10pm as well as the water bill for flooding. We also support Eagle Scout projects that help beautify the rink. To keep the community updated on rink events, we maintain an active Facebook page, www.facebook.com/YardleyWoodRink. 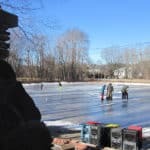 When the weather is cold, we will post updates to the rink is open for skating, when flooding for resurfacing will occur and when we need more help shoveling after a storm. 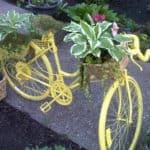 We also post other updates during the year about other events, such as the Garden's Club Plant sale in May and the Easton Lions Club Fun Days. These will be posted on facebook when dates are set.